On the Swedish side of the Øresund, Faiveley Transport Nordic possesses expertise in production of components for the global train industry. In a growing market, upgrading their production equipment was an absolute necessity. Danish DSB is doing it, Swedish SJ is doing it, and many of the other major train operators around the world are doing it too. They are placing orders for components with the Swedish division of Faiveley Transport, the global player in the railroad market recently acquired by the US company General Electric. The division, which was founded as an independent business in Sweden over a hundred years ago, has seen stable growth since the financial crisis, and previous discussions about outsourcing production of components such as brakes and brake regulators to low-wage countries have gradually been dropped. 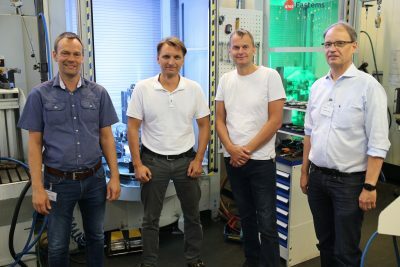 Following its very recent acquisition by General Electric, a new management team is about to take over, but up until now the high level of expertise at the Scanian manufacturer, especially within cutting machining, has reaped benefits. Customer requirements, especially for critical components such as braking systems (the ratio between new production and reconditioning projects is 50/50) that may date back several decades demand production know-how and the option of working flexibly and rapidly down to single item production of more than 250 different product models. Not to mention systems that are unknown in advance. But price is always a significant factor for an industry with global competition. For this reason, Faiveley have opted, with the approval of their former French owners of the past 10 years, to invest in updating their production equipment to the latest technology within robot automation and high quality CNC machining. 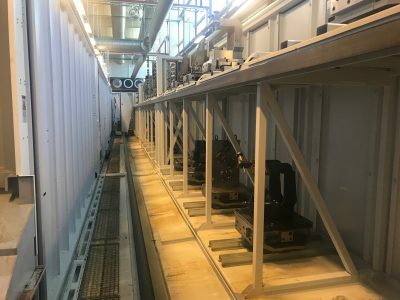 In the spring, two Makino a81nx CNC machining centers were installed, followed by a third of the same type in January 2018, in addition to a separate Nakamura-Thome NTRX-300 CNC machining center, supplied by Johan Nordström Verktygsmaskiner AB through Urban Åström. In order to achieve maximum returns from the massive investment in its cutting production equipment, Faiveley decided to contact Henrik Brodén, the man in charge of Finnish company Fastems’ operations in Sweden, about creating an integrated robotic automation solution. The final selection was a so-called container solution, FPC-1000, with pallets 500 millimeters wide. The standard pallet size is 630 millimeters, but as the pallets in the previous system were 500 millimeters, Faiveley were keen to keep using this dimension. Doing so also made it possible to maximize the number of pallet stations in relation to available space, as the requested 30 stations took up five meters less space. According to Richard Paulsson, the investment in machinery marks 10 fantastic years that have provided substantial growth since the financial crisis left its mark and there is nothing in the current situation to indicate any changes that will have an adverse effect in the immediate future. “We look forward to familiarizing ourselves with the machinery and Fastems’ solution in order to utilize all the features it offers to increase productivity, in particular use of the MMS software so that we can eventually achieve close to 8,760 production hours per year,” he comments. Learn more about our automation solutions! Written by Thore Dam Mortensen, originally published by Teknovation. Copyright of all article pictures: Dam Mortensen / Teknovation.